Pedro Jose Pietri Ramos (1854-1906) and his wife Carmen Gabriela Pietri Canales and Teresa de Jesús Pietri Ramos and her husband Corsican born José Pietri Moretti (1839- ), son and daughter of Basilio Pietri Guidicelli and his wife Trinidad Ramos. At the time Teresa took ownership of Hacienda Salvación, she also inherited the adjoining Hacienda Santa Teresa. José Pietri Pietri (1872-1933) who married Rita Victoria Mejia Nigaglioni (1882- ) in 1900 and after divorcing her in 1907 married a second time Laura Natali Lagomarsini in 1909, the son of José Pietri Moretti, and his wife Teresa de Jesús Pietri Ramos. In addition to ownership in Hacienda Salvación and Santa Teresa, José Pietri Pietri also owned the adjoining Hacienda San Lorenzo, Hacienda Belgodere in Guayanilla, Hacienda Esperanza in Barrio Anones of Añasco, owned 30 cuerdas planted with coffee trees in Barrio Rubias and of another coffee plantation and sugar factory in Barrio Vegas of Yauco, today under the waters of Lake Luchetti. José Manuel (Pepe) Pietri Mejia (1901-1985), the son of José Pietri Pietri and his wife Rita Victoria Mejia Nigaglioni. Pepe married Rosario Bacó Polidori in 1925, he married a second time in the 1930s Enilda Rodriguez Barrero (1916- ) and at the time of his death was married to Ruth Vega. Jose Manuel (Pepito) Pietri Rodriguez (1938- ), the son of José Pietri Mejia and his wife Enilda Rodriguez Barrero. 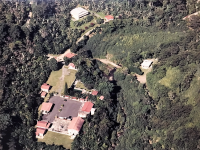 ​In 1976 José Pietri Rodriguez sold most of the land to the Government of Puerto Rico Rural Development Administration who segregated the land and gave the lots as "parcelas" to local families. The remaining structures were at one time remodeled to convert them into an inn. It is located in Barrio Rio Prieto on PR-428 just East of the boundary between Yauco and Maricao. These pictures are part of a 1987 study by Archeologist Dr. Luis Pumarada O'Neill, source: Puerto Rico State Historic Preservation Office.